These girls have amazing tight vocal harmonies that will draw you in as they sing about life's incongruities and how to have some fun along the way. The band is solid, the music is engaging, and the lyrics are hysterical! Despite their proclivity for snacking, rather than actually rehearsing, The Bats continue to work up new tunes in the depths of the BatCave (Marilyn's basement studio), where, between the mango salsa and the broccomole, tight harmonies are refined, cool guitar licks are developed, and choreography is, well, mostly discouraged. 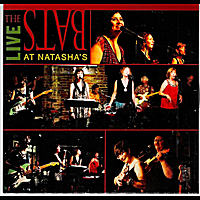 In this CD, they offer an audio glimpse of their live performance at Natasha's, which is REALLY FUN! particularly for adults. Buy this album. Oh, and if you have any connections, we would like to be on the "Ellen Show", please. and thank you. The women are the most bat-tastic group ever! Their songs make you laugh, make you think, heck they make me think sometimes that they are singing about my life. If you ever get to Lexington, KY (we have - driven hours from the Lake Erie area just to see them in person) to see them perform, it will be worth the time, drive and money to see them. Natasha's has such a wonderful atmosphere, and adding The Bats just makes your whole evening fun!